Please see a Community Announcement at the bottom of this post. I can make no excuses about my absence here, except to say the past months have been fraught with challenges in our family—from health issues to difficult circumstances surrounding Logan's well-being. But I've been inspired by recent events, which I will share with you now. Monday, a friend visiting from Toronto broadcast (yes, he Tweeted!) that he was seeking photographic inspiration. I suggested a visit to the UCSC Farm & Garden, and he accepted. The day was overcast, which is optimal for photography—no glare, no harsh shadows, and clear colors. We met my daughter up at the Alan Chadwick Garden, a two-acre terraced hillside garden that is predominantly orchard, but which also contains rows of vegetables—lots of over-wintered peppers and some Napa cabbages were present on our visit. It was the first time I'd been to the up there in February—everything was muddy, covered in mustard grass and other "weeds" (it's hard for me to call anything green a weed), and sloppily beautiful despite the disorder. The garden is so different in winter. All the bare stone fruit trees—with their gnarled, grey branches—contrasted with the citrus trees, which were bearing heavily amid their dense, dark, waxy leaves. To someone else's eye, there might not be much to see, but I was seeing things in a new way, and I loved it. It may not look like much to you, but there's gold in them-thar spills. The broken vines and browning leaves concealed a wealth of dry-farmed Early Girl tomatoes out at Everett Family Farm, where I was invited to "glean" today. With the first major rainstorm predicted to begin tonight, Leon Vehaba called me to let me know that he had a crew of pickers out there, trying to save every last tomato they could. But no one could possibly pick them all, so I got an invitation to scrounge through the plants and see what I could come up with. That's just part of it—I also got a flat of small yellow heirlooms, some butternut squashes, and a couple of pretty little pumpkins for Logan. My friend, Lindsay, brought her toddler, Julian, and remarked, "Look at all this food around us." We were surrounded not only by the waning tomatoes, but by rows of carrots, beets, broccoli, chard, kale, greens, and hundreds of apple trees of many varieties. Alongside us, three young men whom Leon had hired to pick were concluding their day's work by scooping up the errant squashes and apples. "Gleaning," they called it, and of course, it was. "We all used to eat like this," she continued. "And now, full circle." Under the cloudy grey sky, it was easier for me to remember true autumn weather back east, and to feel connected to the seasonality of our food. 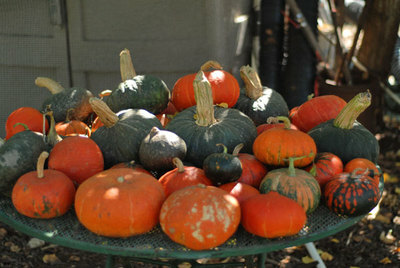 I regarded the butternut, thinking of Mollie Katzen's recipe for curried butternut squash soup with shiitake mushrooms. And hopefully, tomorrow, I'll have the comforting scent of tomatoes roasting in the oven, so I can "taste a little of the summer," as Greg Brown says in Canned Goods, when the winter is beating its path through our part of the world. Pictured here: dried beans at Dirty Girl Produce's booth at the Sunday farmers market in Live Oak. Don't they make you want to run your hands through them? I have no good reason for not writing in so long, except to say that life has been complicated and more than a little tough. We lost custody of our precious little grandson, Logan, last month, when he was restored to his parents. Fortunately, we will be having a shared custody situation again, with Logan's father, for the foreseeable future. Meanwhile, Logan has started kindergarten, and absolutely loves it. He's happy, he sings all the time, and frequently says, "Wherever my Poppy goes, I'm going, TOO." Here he is pictured in our corn patch, sitting on a stepladder. He helped grow that corn, he'll have you know. Pictured here: our neighbors' darling baby boy, Julian, who occupies a little of my time nearly every day. Because babies are church. The short answer is that I've been working really, really hard for the "Grow a Farmer" Campaign, on an almost daily basis. The good news there is that we (the board of directors for the Friends of the UCSC Farm & Garden, and the staff and everyone affiliated with CASFS) have very nearly reached our first goal of $250K. The next goal will be to replace the funds that we took from our resources, which is not like robbing Peter to pay Paul—those funds were for general use, such as scholarships and other needs for apprentices. It feels FABULOUS to be in this position, especially given the severity of emotional turmoil surrounding our little grandson's broken leg. (He is fine, after nearly four months in casts, a metal boot, and being careful.) Coming up: swimming lessons for a boy! I have had several great adventures, including turning fifty (April 30), something I had dreaded badly—turned out to be one of the best birthdays of my life. So here's installment #1 of "Where I've Been Since April 8." April 13: a visit to Love Apple Farm, to meet up with the wonderful Harold McGee, who arrived seeking advice for his new garden in San Francisco. It's been three years since we had dined under redwoods on foraged food and wild boar, and it was a great visit. Cynthia chose some tomatoes especially for his climate (and palate), and he in turn autographed our "McGee" books. Any day that one can spend at Love Apple Farm is a blessing, a de-stressing. This was a fine day, indeed, especially because the sweet peas were tall and fragant. On April 24, I got to do one of my favorite things in the world, which is to cook for the apprentices at the UCSC Farm. This is the annual reception, a couple of weeks after they've arrived. So many new faces, and so much great experience among them. I just walked around and met a few folks before heading over to the kitchen to help my darlin' friend, Forrest Cook, get things prepped. Our team (other board members and volunteers) shelled ten pounds of fava beans, peeled 11 dozen hard-boiled eggs, and made a whole lot of other stuff. The very next day, Matthew Sutton, co-president of our board, hosted a pizza and beer fundraiser with some other former apprentices. Some hundreds of people turned out for Matthew's famous wood-fired pizza, live bluegrass, and more: the event raised over $1500 for the "Grow a Farmer" Campaign. A little later in the week, I headed up to SFO to bring Sam Miller back to Love Apple Farm. Sam's hoping to move from England to start up a farming venture of his own—something that would make a huge number of people I know very happy. We came down coastal Highway One, stopping in Pescadero. First stop: Harley Farms Goat Dairy, where the goats were just coming in to be milked. Well, not this little kid. Sam had never had calamari, so we shared a steak sandwich and agreed that it wins Best of Show for All Breeds of Seafood Ensconced in a Perfect Roll. A little beer, a little wine, and that was Pescadero in April. Coming up next: my birthday, some farm visits, some food-centric happenings, Big Sur, and more. 1. If you're going to be downtown Santa Cruz after the farmers market next Wednesday, June 24, see about getting a ticket to the "Grow a Farmer" Summer Soirée. Appetizers and wine, great people…all proceeds benefit the campaign. Also: the Santa Cruz Board of Supervisors will present the "Grow a Farmer" Month proclamation for the month of June. It should be a fine event, and there will be more news about our progress in raising the funds for the apprenticeship housing project. 2. Want a direct way to support a local farm? TLC Ranch (my friends and heroes) are trying to buy the house they've been renting before it gets sold out from under them. For a limited time, you can purchase egg shares at a substantial discount: visit their website for details. "Grow a Farmer" Campaign? Food Bloggers, C'mon Down! Pictured here: Adrea Tencer, a former apprentice at the UCSC Farm & Garden's six-month residential program for training in all aspects of sustainable agriculture. So, for six weeks beginning in mid-February, I did not take a day off. I was working on three websites: two directly related to today's BIG WONDERFUL & EXCITING NEWS post. I'm here to introduce the "Grow a Farmer" Campaign, a nationwide project to raise $250K for permanent housing for the apprentices who live on the farm during their residential program. For forty-plus years, the apprentices have lived in tents on the periphery of the farm. Last year, they were told this is no longer an option, and UCSC began accepting bids for permanent tent cabins. One was accepted, and then costs for labor and materials went up—the result being that the bid rose by $250K. The Friends board worked on finding solutions, and in a frenzy of inspiration, the "Grow a Farmer" Campaign was conceived and born over a two-week span in January. The response has been amazing. Newman's Own Foundation gave $50K, which is their maximum donation. The Obaboa Foundation and Olivia Boyce-Abel have created a $20K matching grant challenge (read more below). The campaign is asking farm-loving chefs to support the cause in a couple of ways...either by hosting a benefit dinner, as Chez Panisse is doing on May 6 (among others whose number is growing daily), or by donating $10 a day for the Merry Month of May. That $300 will make a restaurant (or any business) a Partner, to be listed on the website. Businesses like Earthbound Farm and Johnny's Selected Seeds are donors. Other business opportunities include holding "Community Day" and donating (for example) 5% of the day's sales to the campaign. Non-profits and other organizations who can't hold events still have opportunities to participate, even by merely spreading the word via a mailing list, or making a donation. These people are Pollinators, and will be linked on the website. There are other ways for individuals—including, hello? you former apprentices—to have fun Growing a Farmer. You can host a fundraising event—a farm tour, a house or garden party—and we'll have materials for you that will help your event succeed. And then there are yet other creative ways to help this campaign, the most inspiring of which so far is the incredibly generous offering from Chef David Kinch and Manresa Restaurant. Concerned that a "mere" cash donation wouldn't maximize the potential to help raise the funds, the chef instead is offering up two Chef's Special Tasting dinners, with wine pairings. These dinners will be awarded to the highest donors in the Obaboa Foundation's matching grant challenge. I have been involved in organic gardening, farming and seed production since 1967 due to my life-shaping apprenticeship with Alan Chadwick at the garden at the University of Santa Cruz. I worked at my own farm, Camp Joy, then with Renee Shepherd, and now am on the board of the Organic Seed Alliance. As farmers are the very base of all the fabulous food we cook at home or eat in restaurants, and the flowers that are such an important part of most of our lives, maybe this would make an interesting story, especially since the Garden and Farm is the mothership for so many of our local farmers – past, present and future. We need as many good farmers as we can get, and the training program in Santa Cruz has been training and inspiring folks all over the country and the world for over 40 years. 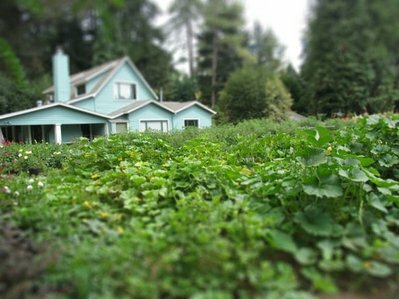 This is the website that was just launched for nationwide Grow A Farmer month in May – we are fundraising for permanent apprentice housing at the UCSC Farm and Garden. Living on site is an essential part of the program and the University has given us until June to raise the money to start actually building the shovel-ready project. I have been racking my brains for like minded businesses or individuals that might be able to contribute in any way. I’m sure your organization has subscribers who’ve been trained or inspired by the Farm and Garden or its offshoots, so I thought perhaps you might be one of our business contributors, or maybe write something up about our efforts. Please take a minute and look at our website, as it is a great way to explain what we are working on. If there is someone more appropriate that I could speak to in person, please give me the contact information. There may be a way you can help by going to a dinner or shopping at one of the participating businesses or restaurants, making a donation, or passing the publicity on to someone else or connecting us with someone who would like to be part of this exciting campaign – please go to the brand new site and see what you think! Events will be added to the website as they are scheduled. So that's it, in one very large, very aromatic nutshell. Do these apprentices a BIG favor: use Facebook, Yelp, and Twitter it up! Spread the word, spread the energy, and come on board. I'm counting on food bloggers to help here: we will arrange personal farm tours if you want to come visit. And we'll add YOUR blog to our website, both as a Pollinator and as a Blogging Partner. If you're looking for a restaurant near you that supports local farms, start with LocalHarvest.org. Plug in your zip code, and see what pops up. Or contact us on the Grow a Farmer site: we might be able to put you in touch with former apprentices in your area who can hook you up. If your restaurant IS going to participate, please get a free member listing at LocalHarvest and add your event to the mailing list called "Keep Me Posted." LocalHarvest's newsletter goes out every Wednesday morning to over 45,000 people, and they are the premier website in the world for their niche: guiding people to local food and eating well. And that's the news across the nation. Sorry to have been missing in action: this is the biggest project of my life, and by far, the best. Yes, we can! Thanks for visiting. Will you be a Cultivator? 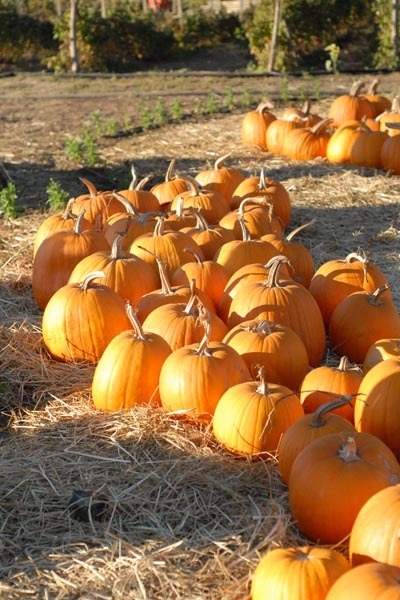 Pictured here: squashes and pumpkins at Love Apple Farm, where I've been visiting lately. There are many reasons I've not been writing—all of October, even. Foremost, I've got some steady part-time work, and second to that, we've had more visitors and socializing in the last three weeks than in the past ten years. Some other projects and interests have popped up—not the least of which has been the birth of a baby boy in the house next door, and I've been (self-)appointed Court Photographer. I'm behind in e-mails and in other areas of life. I only have time today for three brief announcements of some events very soon, and maybe you can avail yourselves of them. And then I hope to get back in the saddle with blogging. Much is happening on the local farm scene, and most all of it is wonderful. Yet another cool thing to do with your kids and their schools. On October 18, my friends Lori and Jeff Fiorovich will host a Farm to School Day at Crystal Bay Farm in Watsonville. Read the press release below, and see the faces of your host farmers, when Logan was just two and a half.